The C.K. Blandin Foundation plans to launch the Minnesota Intelligent Rural Communities initiative, a multi-sector, comprehensive approach to sustainable broadband adoption targeting residents, small businesses, local governments, and critical services providers in rural Minnesota. The initiative expects to reach each of Minnesota’s 80 rural counties through education, training, technical assistance, and by removing barriers to broadband adoption. The project anticipates training as many as 2,500 individuals in computer literacy, online education, and workforce development, and plans to distribute 1,000 affordable refurbished computers to low-income, rural Minnesota residents. Funding will support the development of institutional broadband applications for schools and health care facilities to help increase broadband adoption. The U.S. Department of Commerce’s Economic Development Administration (EDA) Center at the University of Minnesota, Crookston will help track the impact of the project, including the number of subscribers generated. The C.K. Blandin Foundation worked to make broadband an integral part of Minnesotans’ lives through the Minnesota Intelligent Rural Communities (MIRC) project. 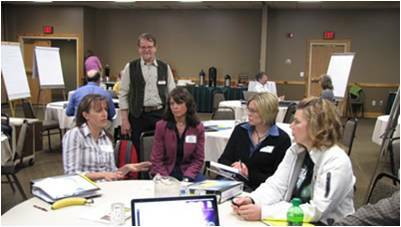 MIRC was a collaborative project between the Blandin Foundation and project partners focused on supporting individuals and communities in rural Minnesota, especially the unemployed, small businesses, local leaders, and coalitions of government entities. The Blandin Foundation estimated that it had encouraged more than 56,000 households to subscribe to broadband services. The Blandin Foundation partnered with the University of Minnesota Extension (UME) to provide technical assistance and training to small businesses in rural areas. UME held training and outreach events and provided technical assistance to small businesses with fewer than 10 employees in the retail, food, and tourism industries. The organization was also able to provide outreach to approximately 6,000 small businesses with a primary focus on minority and women-owned businesses. Another project partner, the Minnesota Renewable Energy Marketplace (MNREM), provided technical assistance and training to renewable energy businesses in rural areas, and delivered at least 1,500 hours of training and technical assistance. MNREM resources focused on industry-specific, customer relationship management, and e-commerce applications designed to produce efficiencies and promote business growth.